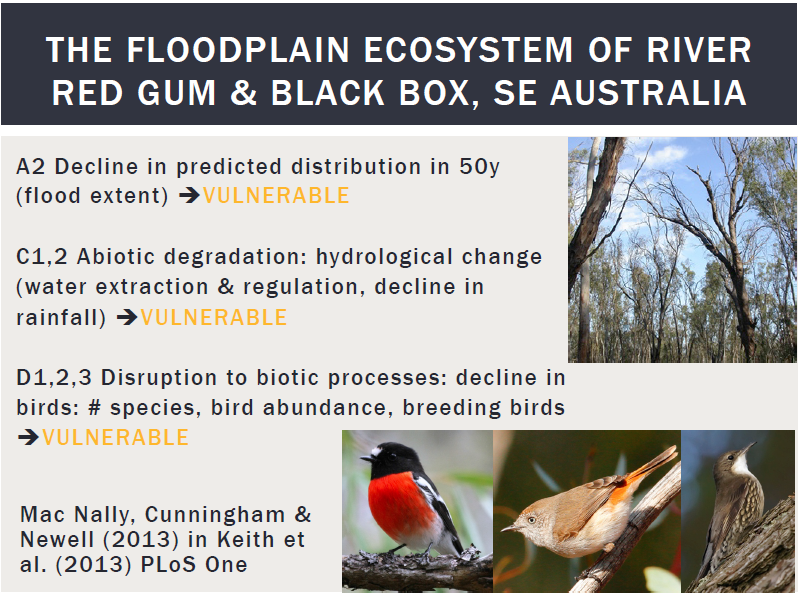 The role of satellite remote sensing in ecosystem risk assessment, particularly in how it is used as part of the Red List of Ecosystems (RLE), was discussed by Dr Emily Nicholson, from Deakin University in Australia, at the ZSL Symposium on Remote Sensing for Biodiversity. Most of us have heard of the IUCN Red List of Threatened Species. It is the traffic light system that assesses the conservation status of species (as well as subspecies, varieties, and even selected subpopulations) on a global scale, and classifies them into categories such as Extinct, Critically Endangered, Vulnerable, or the best option, Least Concern (Figure 1). It does this to highlight taxa threatened with extinction, and promote their conservation. It’s been going for 50 years, so has an established assessment methodology. 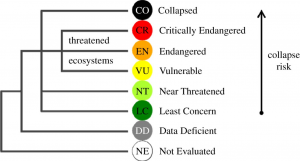 The IUCN has recently expanded this risk assessment approach to whole ecosystems. 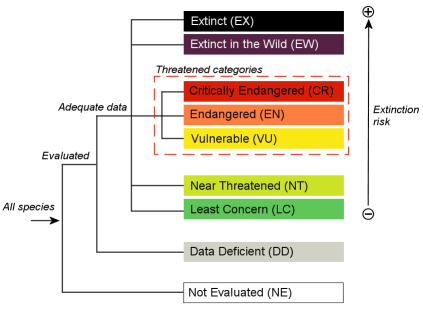 The risk categories are similar to those for Threatened Species but with the difference that instead of ‘Extinct’ for lost and unrecoverable species, ecosystems are “Collapsed” (Figure 2), which occurs when there is a loss of defining features such as species, structure and processes. Dr Nicholson’s talk  emphasised that given the patchiness (both spatially and temporally) of field-data, satellite remote sensing (RS) data can play a critical role in the definition of ecosystem types, evaluating their distribution and change in distribution, and in assessing degradation and change in ecological function. 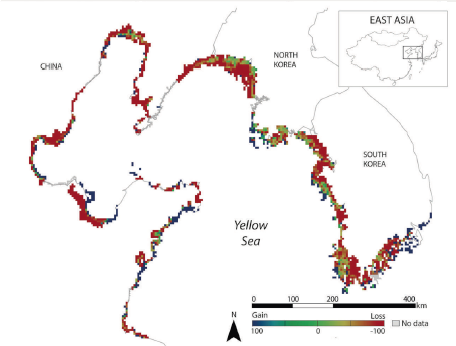 coastlines of China, North Korea and South Korea (Figure 3). Much of its extent has been lost and it suffers from increasing frequency of algal blooms, hypoxic dead zones and jellyfish blooms, and declines of commercial fisheries and migratory bird populations, suggesting that this ecosystem is degraded and declining . Researchers , compared standardized remotely sensed habitat data and historic topographic map data which indicated that in the last 50 years, a decline of more than 50% but less than 80% of tidal flat extent has occurred. They applied the RLE criteria to the Yellow Sea tidal flat ecosystem and determined that its status is endangered. Antarctic invertebrate ecosystems – These unique shallow-water communities mostly consist of dark-adapted invertebrates, and rely on sea ice to create low-light marine environments. Figure 4. 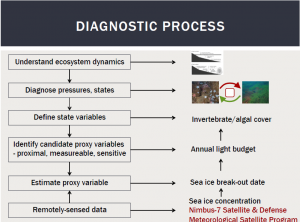 Diagnostic process and assessment outcome for the Antarctic invertebrate ecosystem . Climate change is likely to cause early breakout of seasonal sea ice in parts of Antarctica, which will dramatically increase the amount of light reaching shallow seabed. This is predicted to result in ecological regime shifts, in which invertebrate-dominated communities are replaced by macroalgal beds . Figure 5. Assessment outcome for the Antarctic invertebrate ecosystem . 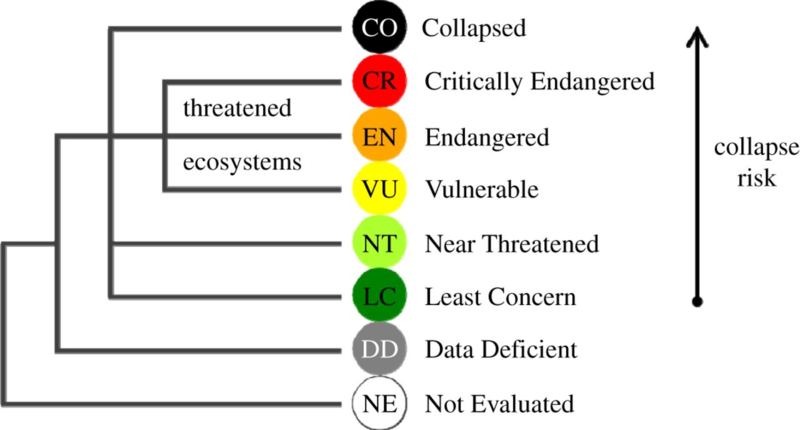 IUCN RLE criteria was used to assess the vulnerability of this system (Figure 4). Remote sensed data, to measure sea ice concentrations, and bathymetric data, was used to estimate their spatial distribution around Antarctica. 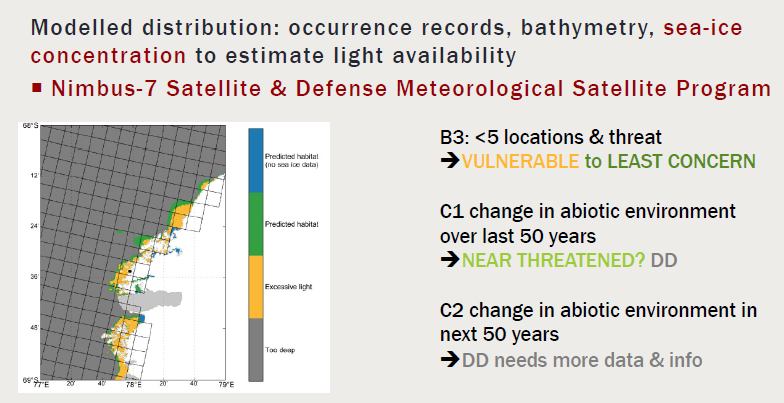 Using the RLE criteria, the authors concluded that shallow ice-covered ecosystems are likely Near Threatened to Vulnerable in places (Figure 5), although the magnitude of risk is spatially variable . Figure 6. 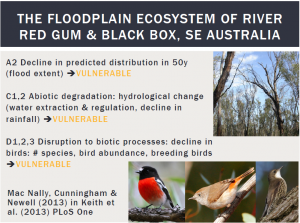 RLE evaluation for the floodplain ecosystem in the southern Murray-Darling Basin . Australia’s largest river system, at 1.1 million km2, is dominated by two tree species, the river red gum (Eucalyptus camaldulensis Dehnh.) and black box (Eucalyptus largiflorens F.Muell.). This ecosystem is threatened by changes in hydrology, grazing and timber harvesting . The use of RS Landsat and Rapideye data, in conjunction with site-based data on condition, was used for validation. 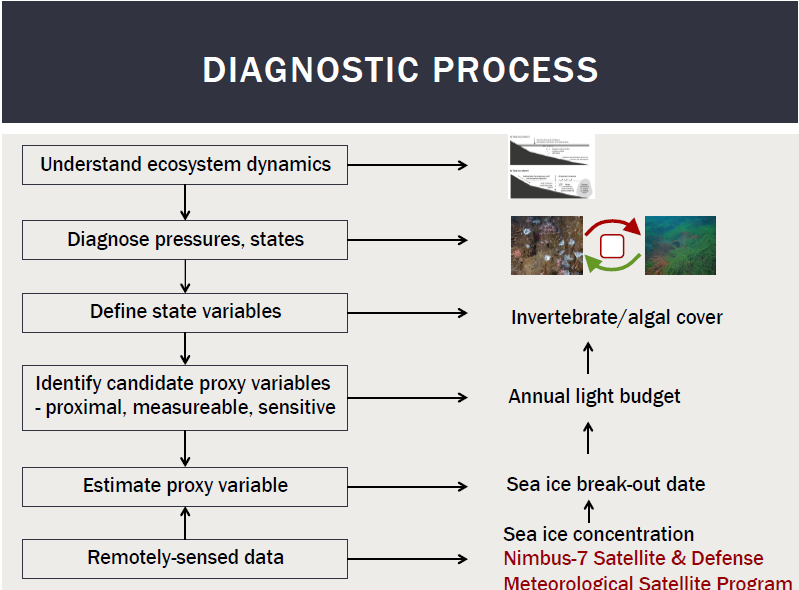 Using the RLE assessment the ecosystem was described as Vulnerable (Figure 6) . 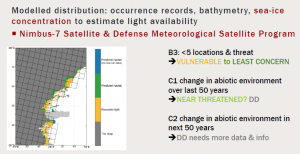 Given the paucity and patchiness of field-data, satellite remote sensing (RS) data can play a critical role in ecosystem assessments. Dr Nicholson emphasised that RS provides tons of data with ever greater spatial & temporal resolution. However, the challenge is to use it thoughtfully to ensure it is ecologically meaningful, and describes ecological processes and functions, not just patterns. Interestingly, it was pointed out in the questions after the talk that all satellite remote sensing needs field validation and often not enough money is put aside in grants for this. Dr Emma Tebbs has expertise in remote sensing of terrestrial and aquatic ecosystems, including forests, wetlands, inland waters and agricultural landscapes. Some of her research is focused on the sustainability of lakes in Kenya and Tanzania where she uses satellite datasets and field measurements to investigate the connections between ecological and hydrological processes in these lakes and to assess the impact of environmental and climatic changes on these ecosystems. Emma has also developed novel methods for mapping natural capital, including a method for mapping vegetation productivity for the UK and a high resolution woody cover product. Prof Martin Wooster uses satellite earth observation (EO) data, as well as airborne sensors to map temporal and spatial variations in global fire emissions. A key current interest is in the quantifying the role of vegetation fires (biomass burning) plays in exchanges of material between the land surface and the atmosphere. He supervises a number of PhD students who use satellite EO: Tianran Zhang, who is using RS to study biomass burning in east China, and Mark de Jong who is applying microwave remote sensing to wildfire danger modelling. Dr Mark Mulligan uses remote sensing data in combination with high-tech field monitoring and distributed process-based computer modelling to explore questions of eco-hydrology and human activity in ecosystems such as tropical montane cloud forests and semi-arid regions. Dr Mulligan also uses RS to map and model ecosystem services using the policy support systems, Water World and Co$tingNature. Nicholson, E. (2016), ‘Satellite remote sensing and the IUCN Red List of Ecosystems.’ Unpublished presentation at: Space – the final frontier for biodiversity monitoring? Symposium, 29 April 2016, ZSL Meeting Rooms, London. This entry was posted in Conference reports, Earth Observation by Maha Mirza. Bookmark the permalink.